Darwin read Shakespeare from an early age and loved Odes to Horace in grade school. In the summer of 1826, Darwin read The Natural History of Selborne by the Rev. Gilbert White. This book would give Darwin a much greater appreciation for wildlife and provide the impetus for his later studies. He went on to Cambridge, where he read quite diversely. Significant titles included William Paley's Natural Theology, Sir John Herschel's Preliminary Discourse on the Study of Natural Philosophy, and Alexander von Humboldt's Personal Narrative. Later, Darwin was never without his copy of Paradise Lost. After Darwin's voyage on the Beagle, he returned to London, where he tried to read metaphysics (quite fashionable reading at the time). But it didn't suit him. Instead, he turned to poets like Samuel Coleridge and William Wordsworth for enjoyment. His wife, Emma, also read novels to him twice a day. He relished the works of legendary authors like Jane Austen, Sir Walter Scott, Elizabeth Gaskell, and Lord Byron. A notoriously active reader, Darwin often annotated his books—and he wasn't shy about expressing his opinion of a work. He viewed them more as tools than tomes, and would even break books in half to make them easier to carry or rip out sections that pertained to his research. 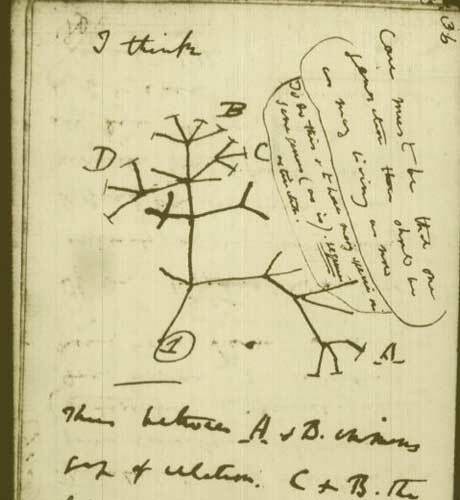 After Darwin finished reading a book, he would methodically go back through his notes and create abstracts. Though Darwin was a scientist, his studies and theories had implications that stretched far beyond the scientific community. 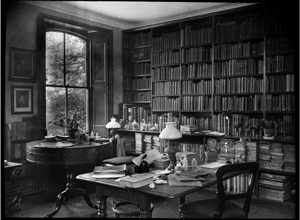 Authors like John Ruskin and Alfred Lord Tennyson reacted to Darwin's theories, as did George Bernard Shaw and Samuel Butler. Moreover, Darwin forced people to grapple with the problem of reconciling religion with scientific discovery—a struggle that has influenced countless writers. Meanwhile Darwin's journey to the isolated islands of the Galapagos has also given many a writer quite the fascinating setting. Aldous Huxley drew upon it for The Island, and Kurt Vonnegut borrowed liberally for his satire, Galapagos. Multiple authors have fictionalized Darwin's life, especially his voyage on the Beagle. Thanks to the Biodiversity Heritage Library, you can peruse the contents of Darwin's library online—many complete with annotations. Take a look, and let us know: did you find anything surprising, exciting, unusual?